As the civil war heats up amid intervention by the Gulf monarchies, thousands are fleeing every day. Many of the thousands of refugees now crossing from Greece and Hungary on their way to more welcoming countries such as Germany are Syrians and Kurds, fleeing the wars and political repression in the Levant. Another large refugee problem may now loom, which is unlikely to leave Europe unaffected. The war in Yemen, already highly destructive, may be getting hotter as it reaches an endgame, with the potential for putting a large proportion of its 24 million people—a slightly larger population than pre-war Syria—on the road (or, more likely, the seas). On Friday, the Saudi-led coalition taking one side in Yemen’s civil war faced a potential disaster for morale. A rocket hit a weapons depot on a base where United Arab Emirates and Bahrain troops were stationed, killing 45 from the UAE and five from Bahrain, in addition to producing an unstated number of casualties. It was the biggest troop loss for the coalition of Gulf Cooperation Council states since they launched the war in late March out of a fear of the Houthi brand of popular politics. With the exception of Saudi Arabia, the GCC countries have small populations and even smaller citizen populations. The UAE has about 9 million people, but only a little over a million of them are thought to be Arab, UAE citizens. The troop deaths were thus taken very hard in the UAE (a popular soccer player was among the dead); proportionally, this toll was like 13,500 American troops killed in one engagement. The base hit by the rocket, in Maarib Province, was set up by the anti-Houthi coalition after the Houthis were largely expelled from it. It is intended as a launching pad for an eventual invasion of the capital, Sana, a Houthi, Zaydi Shiite power base. After the depot was hit, the Saudis and their allies launched a massive campaign of bombing raids on the capital that continued for days. Some 6 million Yemenis are severely food insecure; any additional problem could push them to the brink of starvation. The Houthis, mainly a northern, Shiite tribal force allied with deposed president Ali Abdullah Saleh and a rump of government troops still loyal to him, extended their sway down to Sunni Aden from last April. They’d hoped to block the GCC from using it to offload arms and goods for the southern forces opposing them. At the beginning of August, an undisclosed number of troops from the UAE landed at Aden after a successful effort by southern forces loyal to elected President Abdu Rabbu Mansour Hadi to oust the Houthi rebels from the Arabian Sea port. As long as the Houthis held it, it would have been difficult for the six-nation GCC effort to make real headway in Yemen. The dispatch of ground troops, however, changed the character of the war, since up until that time the Saudi-led coalition had mainly intervened from the air. Moreover, analysts have raised fears that Al Qaeda in the Arabian Peninsula is taking advantage of the chaos to infiltrate the port; AQAP is the Qaeda affiliate most determined to inflict damage on the West. The Saudis and their allies allege that the Houthis are backed by Iran and that their attempted tribal takeover of Yemen was plotted in Tehran, which is a vast exaggeration, as President Obama has admitted. In reality, although Iran has given the Houthis verbal support, there is no reason to think they are a mainly foreign phenomenon, as opposed to being an indigenous tribal movement. Yemen has long been insecure. At the end of 2014 the UN estimated that there were over 600,000 displaced persons and refugees in the country (about half of them Somali refugees). Many of the 300,000 displaced Yemenis had fled government fighting with AQAP, which had a strong position in Abyan, in the country’s southwest, in 2011–12, but was defeated. By this August, with the outbreak of civil war in January and a major foreign intervention, the number of internally displaced Yemenis alone is thought to have risen to about 1.5 million, about 6 percent of the population, proportionally equivalent to more than 19 million Americans—the entirety of Florida or New York. The number is five times what it was just last December. The war has affected even those not forced to flee their homes. Yemen is dry or hilly and water-poor, so the country had been importing nine-tenths of its food before the Houthi coup in January. The ensuing fighting has interfered with such imports. Some 6 million Yemenis are severely food insecure, which means that any further problem, even a small one, could push them to the brink of starvation. In total, some 60 percent of the population faces some form of food insecurity. Only half of Yemenis now have access to potable water. The country’s hospitals have closed in droves and the physicians and nurses have fled, so millions have been left without medical care. 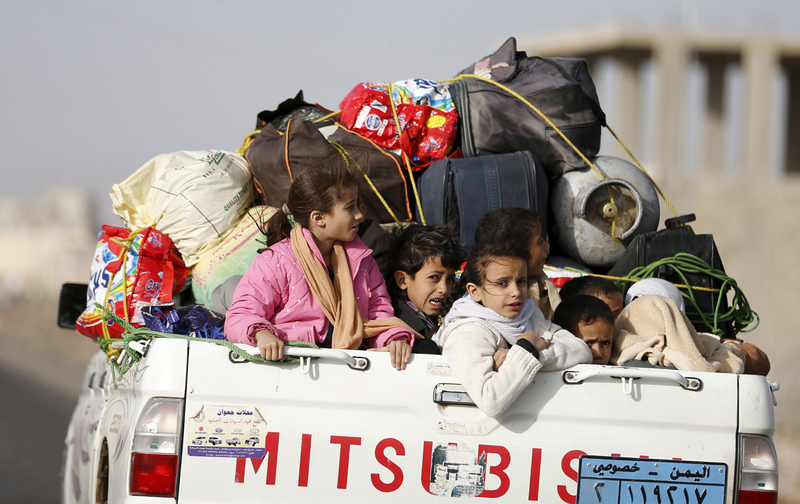 By spring, already some 25,000 Yemenis had fled abroad, but in the course of the GCC air campaign and indiscriminate Houthi shelling this summer, another 100,000 have left the country. Thousands are leaving every week, taking passage in cargo ships across the Red Sea to Djibouti and Somalia in the Horn of Africa, and then some are making their way north to places like Egypt. The only limiting factor so far has been the high cost of passage, but human traffickers are likely to set up shop on the Yemen coast if they smell money. The chaos in Libya makes it a favored launching place for Afro-Asian refugees attempting to get to Europe, and a stream of Yemenis could make their way to the Mediterranean coast. If the Saudi-led coalition does manage to conquer Sana by main force and then go after the Houthi leadership in their traditional area of Saada, it will be the Zaydi Shiites’ (a third of the population) turn to flee in the tens or hundreds of thousands. On top of declining water aquifers, desertification from climate change, and the threat of terrorism, Yemenis face a hard year. International pledges of aid have largely been empty promises, and proposed cease-fires for humanitarian corridors have typically broken down almost immediately. Because Yemen is so much farther from Europe, its tragedy has received less press attention than Syria’s, but its wars could be even more disruptive.